Laboratories characterizing monoclonal antibodies (mAb) now have additional hydrophobic interaction chromatography (HIC) selectivity options, thanks to the expanded family of Thermo Scientific MAbPac HIC HPLC columns. 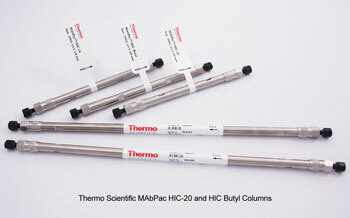 New Thermo Scientific MAbPac HIC-20 and MAbPac HIC-Butyl columns join the company’s line of columns for monoclonal antibody analysis, a response to customer demand for additional selectivity options for characterizing mAb oxidation variants, intact mAbs, mAb aggregates or fragments and antibody drug conjugates (ADCs). The proprietary chemistry used in the new columns is designed to provide new selectivity in high-resolution separations with excellent biocompatibility and high recovery. The columns are also designed for compatibility with organic solvent and aqueous mobile phase, as well as for rugged stability and very low carry-over. “Our customers have been achieving excellent results analyzing proteins for years with our ProPac HIC-10 columns,” said Ilze Birznieks, product line manager, biocolumns, Thermo Fisher Scientific. “Our R&D team worked with our customers to engineer these new columns, building on our experience to meet their need for analyzing increasingly complex samples”.